After thirty years of development, gene therapy is seeing a surge of progress and profitability. Gene therapies tackle diseases by altering the genetic makeup of patients’ cells. Recent mergers and research developments make this a promising time to invest in the sector. 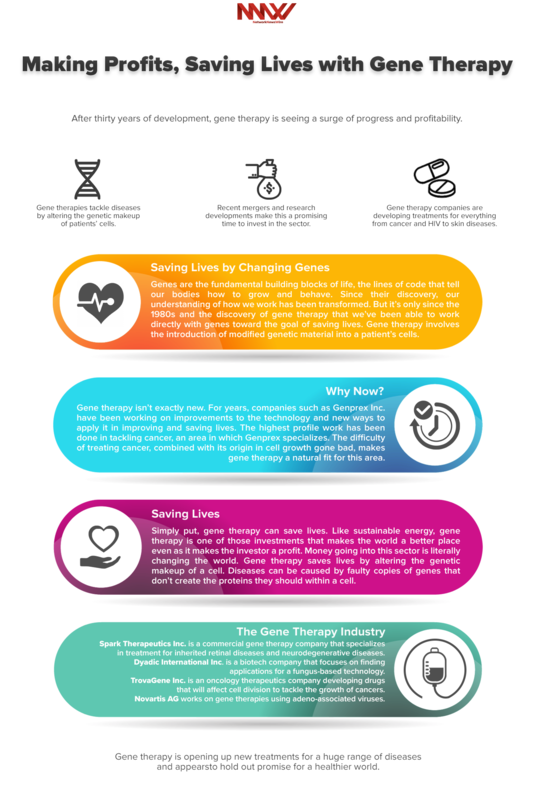 Gene therapy companies are developing treatments for everything from cancer and HIV to skin diseases. Genprex Inc. (NASDAQ: GNPX) (GNPX Profile) is developing treatments to tackle lung cancer. Spark Therapeutics Inc. (NASDAQ: ONCE), which recently entered a merger agreement with the Roche Group, targets ailments such as retinal and neurodegenerative diseases. Dyadic International Inc. (OTCQX: DYAI) is focused on finding uses for a fungal-based technology that could bring treatments to market faster. TrovaGene Inc. (NASDAQ: TROV) uses cell-level treatments to tackle cancer through inhibiting a specific enzyme. The technology developed by Novartis AG (NYSE: NVS) uses specific viruses to deliver treatment for a range of illnesses.